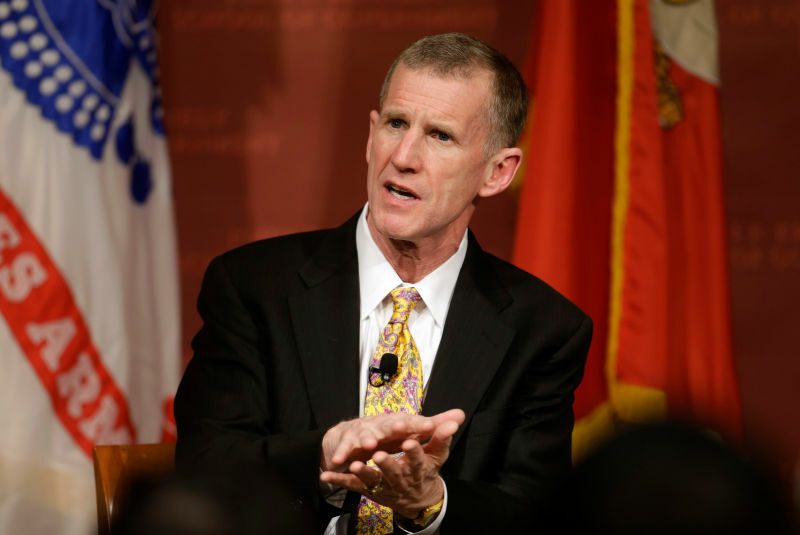 Gen. Stanley McChrystal, U.S. Army (retired), had a really tough time after he was pushed out of the workforce. Would you like to hear about it? He would like to tell you about it. Welcome to LinkedIn's Career Curveball® confessionals! 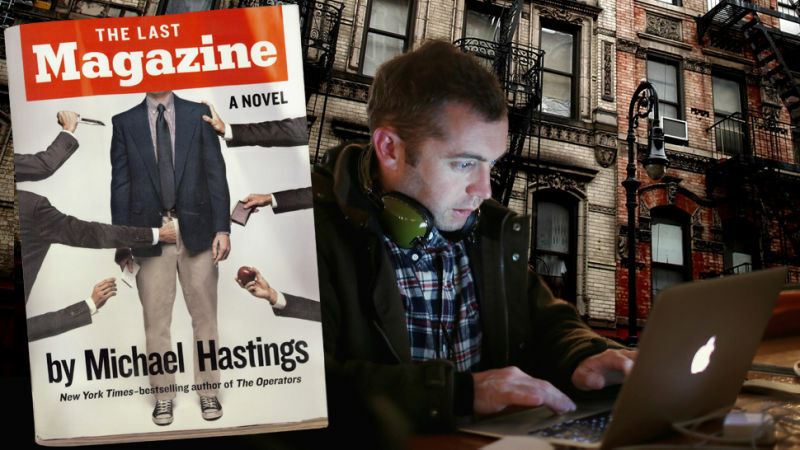 Michael Hastings' book on the Afghanistan war, The Operators, is set to be made into a movie, and Brad Pitt is reportedly being tapped to play Gen. Stanley McChrystal, the Bud Light Lime-swilling war architect who lost his job thanks to Hastings' unflattering profile. The medical examiner's report in the death of muckraking journalist Michael Hastings has been released and, conspiracy theories aside, the coroner has determined his death on June 18th was an accident, and that he had traces drugs in his system at the time he died. In an acknowledged "departure from normal policy," the FBI issued a statement denying that journalist Michael Hastings was under investigation—contrary to what Hastings had apparently been telling friends before his sudden death. Every year, some 18,000 people between the ages of 5 and 34 die in car accidents, the leading cause of death for that age bracket. Which makes a fiery wreck either a sadly unsurprising way for a 33-year-old to die... or the perfect cover for a CIA assassination. 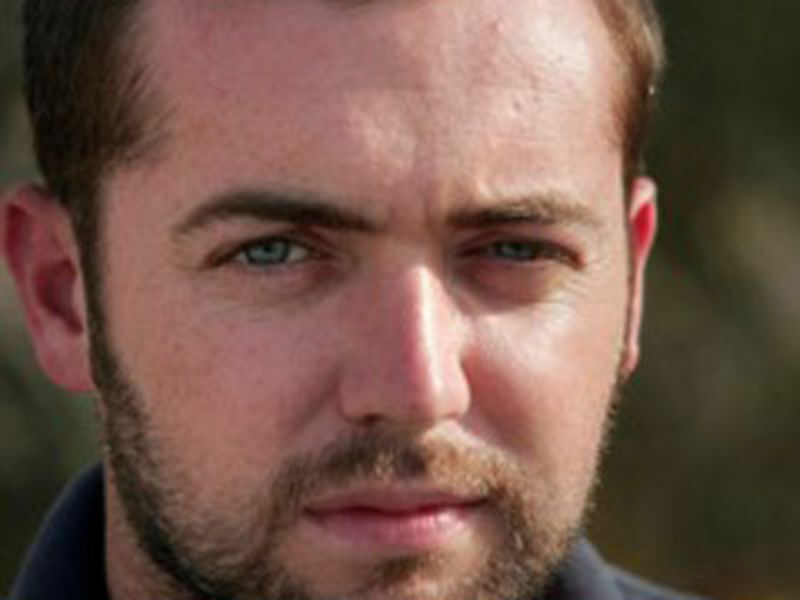 A photographer from freelance photography/videography outfit Loudlabs alleges to have been on the scene immediately after journalist Michael Hastings died in a fiery car crash early yesterday morning. 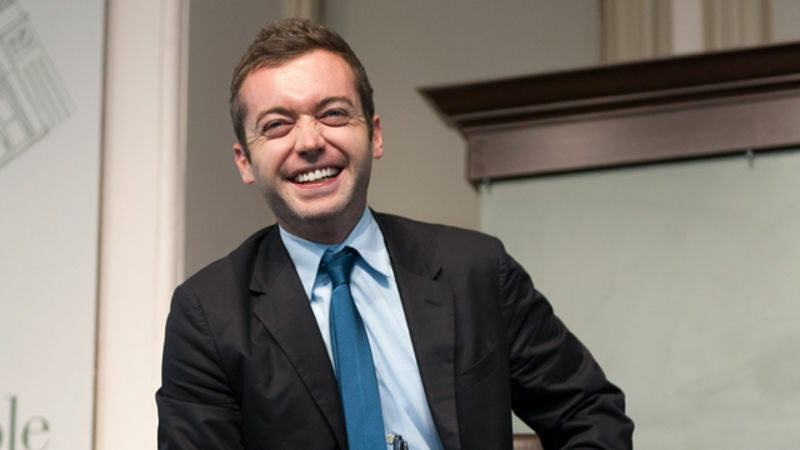 BuzzFeed reporter and Rolling Stone contributing editor Michael Hastings died in a car accident early Tuesday morning in Los Angeles. He was 33. 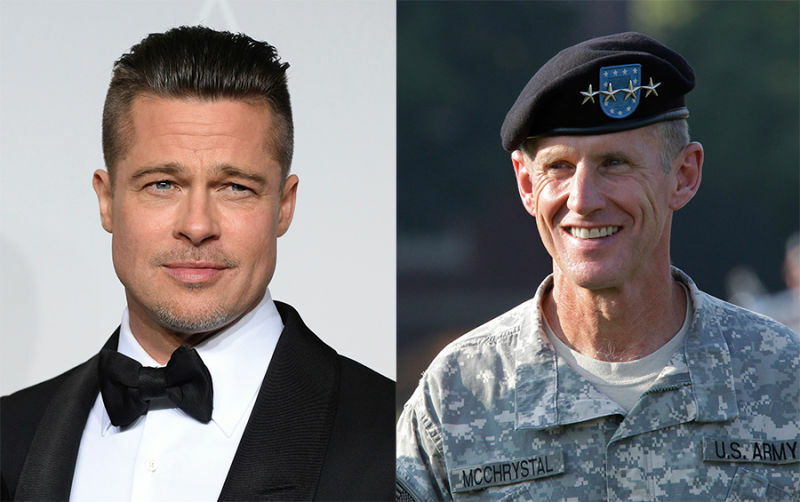 Perhaps best known for his 2010 Rolling Stone profile of General McChrystal, which cost McChrystal his job, Hastings was also the author of two books, including last year's The Operators. 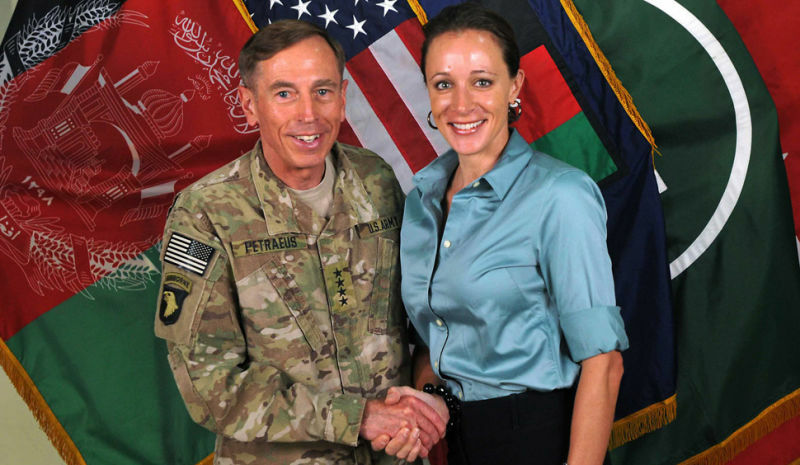 When Beltway bright-boy David Petraeus left public service in disgrace last year, Buzzfeed reporter Michael Hastings threw down a gauntlet, detailing how his industry had gone soft on the ex-general for too long. This morning, Hastings' boss at Buzzfeed picked up that gauntlet and took a long, sugary piss in it. 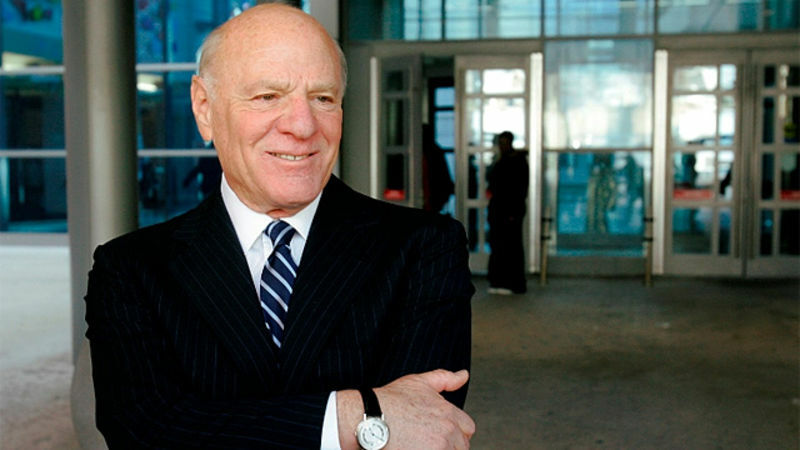 In your sincere Wednesday media column: Barry Diller has endlessly deep pockets, Fox gets an online paywall, Michael Hastings' book deal disappears, The Daily still, improbably, exists, and doing more with less is dead. In your money Monday media column: the Pentagon sides with a general over Rolling Stone, The New Yorker's boring Facebook success, Sidney Harman's unfortunate goodbye column, Les Moonves is overpaid, Glenn Beck is moving, and a history of Fox. 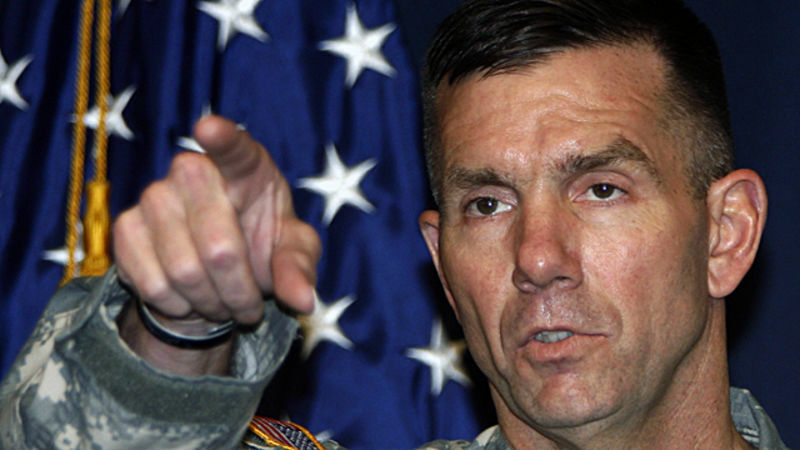 Rolling Stone is trying to add another general to its head count: Michael Hastings, the reporter who dispatched Gen. Stanley McChrystal last year, is reporting that Gen. William Caldwell, who is in charge of training Afghan forces, used Army psychological operations troops to try to influence VIP visitors, including U.S. senators. 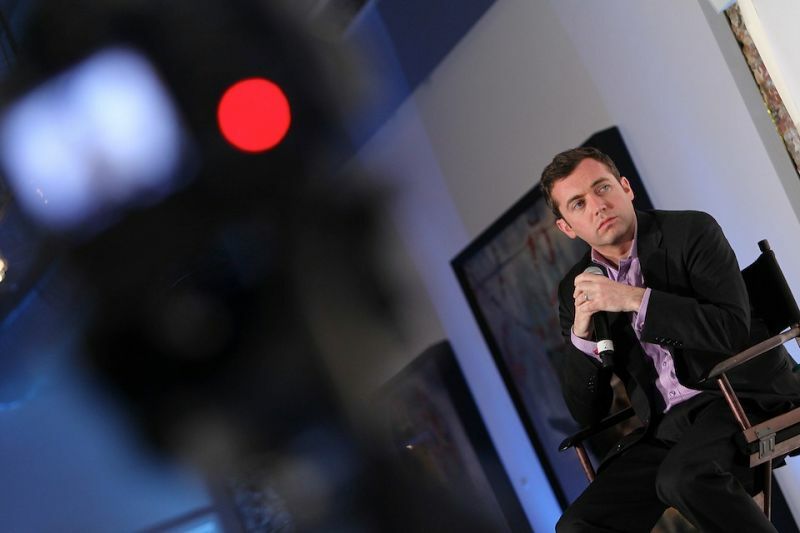 Rolling Stone's Michael Hastings is surprised the Army denied his latest embed request. Generous soul! 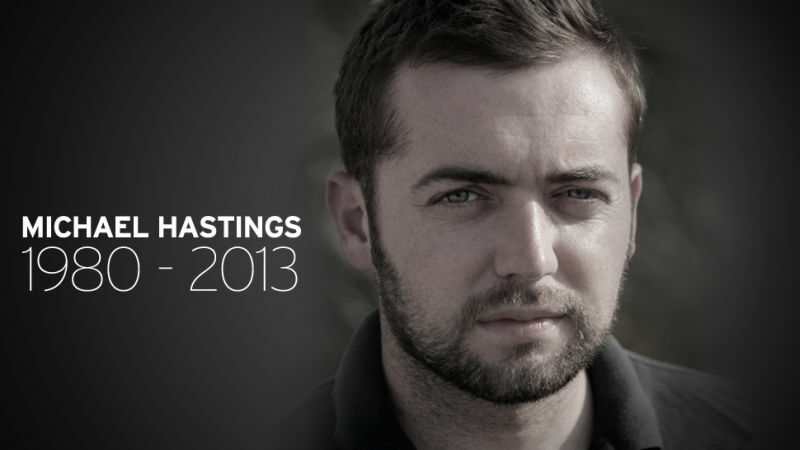 Journalist Michael Hastings—whose article led to Gen. Stanley McChrystal's firing—was denied a Afghanistan embed spot. Why? The Pentagon thought he wouldn't "abide by the ground rules," which are "make fun of Joe Biden" and "bring Bud Lite Lime." Today at Gawker.TV, Nikki Blonsky performs a strip-tease on Huge, Caroline Manzo and Kim Zolciak find Daniell Staub's lesbianism "offensive," Warren the Ape kidnaps a classroom to teach them how the "real world" works, and Craig Kilborn returns to television. Stephen Colbert petitions to join Simon and Colbert, lauds the work of Terry Richardson and General Petraeus, and asks Michael Hastings where he got the audacity publish the article that lost General McChrystal his job. 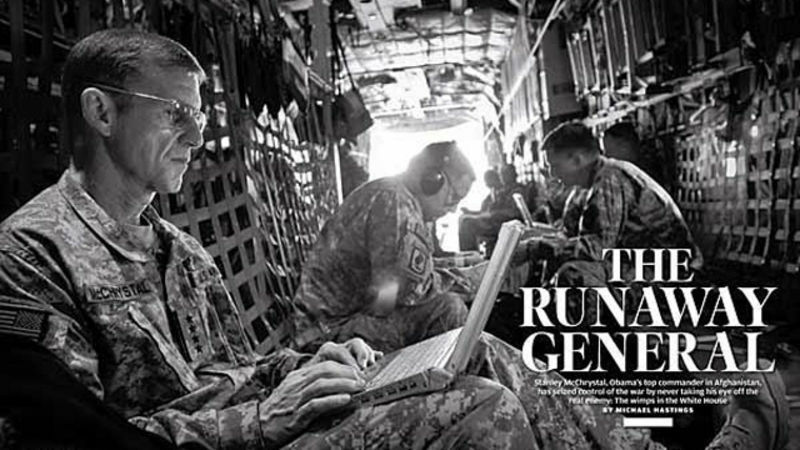 Rolling Stone got its nice big "Dominate the news cycle" turn last week with Michael Hastings' Gen. McChrystal story. Will this revive Rolling Stone as a culturally relevant touchstone? Not a chance. Silly David Brooks. 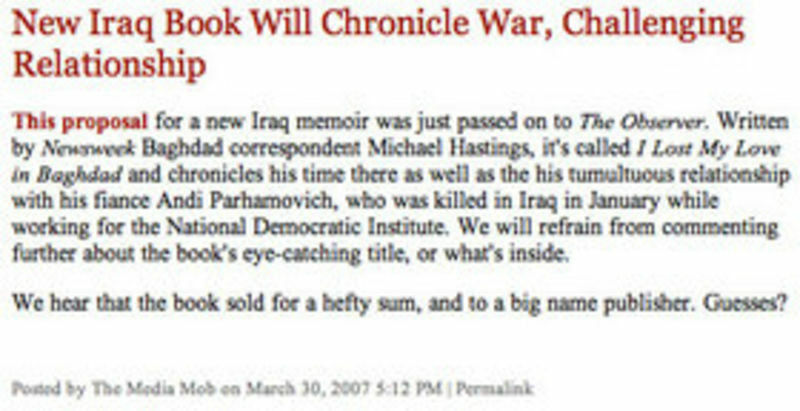 In his Times column today, Brooks condemns Rolling Stone reporter Michael Hastings for being so childish as to print illuminating, on-the-record words from Stanley McChrystal and his aides. 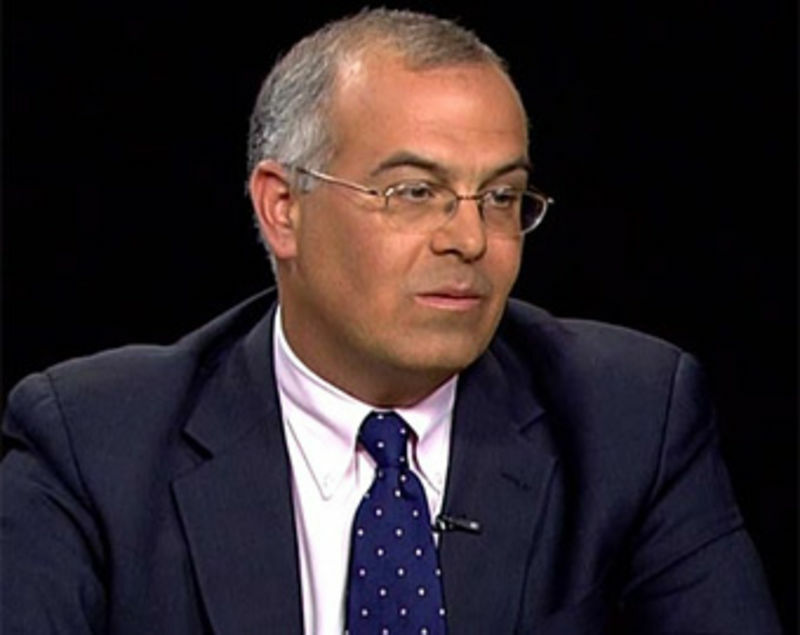 Why can't Hastings be as cautious as David Brooks? Notable in the Times obit today: "The defining moment of Mr. Vonnegut's life was the firebombing of Dresden, Germany, by Allied forces in 1945.... His experience in Dresden was the basis of 'Slaughterhouse-Five,' which was published in 1969...."
On Friday at a little after 5 p.m., the New York Observer posted up a 131-page book proposal by Michael Hastings, a Newsweek Baghdad correspondent. The memoir is about his time overseas and the death of his fiance. The Observer post promptly disappeared. Besides the obvious copyright issues with making the whole shebang available, there was another reason mega-lit agent (and poet!) Andrew Wylie wanted the proposal disappeared from the internet: it was going to get people killed in Iraq.